Why is a years-old, not especially impressive surveillance system suddenly the talk of the Web? Sarah Hedgecock explains. When WikiLeaks began releasing internal e-mails from the powerful “global intelligence” firm Stratfor, it created a web-wide burst of conspiracies, warnings, and activism about TrapWire, a privately run surveillance system that at first glance seems pretty science fiction-y. So don your tinfoil hat and learn all about TrapWire, Stratfor, and what you should really be worrying about. While it’s been widely described as a Minority Report-like, global facial-recognition surveillance system to predict your every move, it’s actually much less exciting than that. TrapWire is kind of predictive, but it doesn’t apparently rely on facial recognition—probably because the company isn’t very good at that particular technology yet. It’s not necessarily worldwide, though its list of reported users is pretty extensive: Las Vegas casinos, #10 Downing Street, the New York City subway system (though the Department has flatly denied using the system), the LAPD, Washington, D.C., and all of Texas. Basically, TrapWire uses whatever closed-circuit cameras the user can access (like those domed security cameras on the ceilings of grocery stores, in the subway, and, well, everywhere else) to monitor activity. Nothing new so far; security cameras tend to do that kind of thing. But here’s where it gets interesting: “suspicious activities” – taking pictures, making measurements, and other things that could point to a nefarious terrorist plot – can be flagged. These are combined with civilian reports aggregated by the software (think “If you see something, say something”), and assessed by TrapWire analysts. The resulting “suspicious activity reports” are sent to the user and any relevant law enforcement, including the Department of Homeland Security. The idea is to catch potential terrorists before they actually do anything and to connect geographically dispersed plotters and plots. Or that, at least, was Stratfor’s sales pitch about the system, and what the Web was responding to. When did this whole thing start? 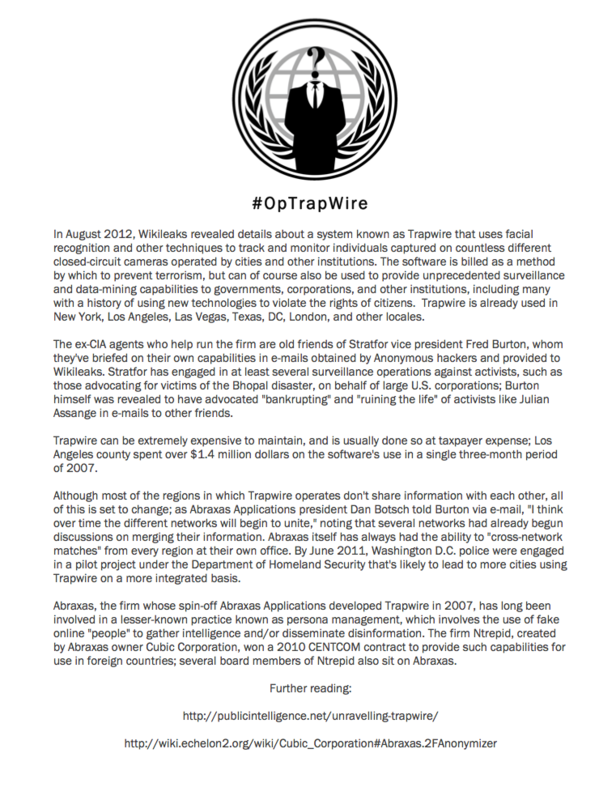 TrapWire was created in 2004 and quickly became an independent spinoff from its parent company, intelligence powerhouse Abraxas Corporation. It began selling its software to private businesses, governments, and agencies. Its use has since expanded, and there are suspicions (or hopes, depending on how you feel about the whole thing) that eventually all the regional TrapWire networks will be linked into a national surveillance behemoth. Stratfor – a major surveillance think tank (it’s short for “Strategic Forecasting) – was (over-)hyping TrapWire for the simplest of reasons: a 2009 contract that gave the wired-in firm an 8 percent referral fee for sales TrapWire made through their recommendations. One of Stratfor's big commodities is its weekly newsletter, a $20,000 a year must-read subscription in the spook world that details all the latest security developments. Three months after the referral deal was signed, the letter plugged TrapWire as a surveillance revolution that uses “camera systems to help detect patterns of preoperational surveillance … [and] cut through the fog of noise and activity and draw attention to potential threats.” The letter made no mention of Stratfor’s commission for hyping the system. But that happened three years ago. Why is TrapWire all over today’s news? Because of Anonymous. Everyone’s favorite “hacktivist” group struck again on December 24th, 2011, getting their hands on a reported 5 million Stratfor e-mails dating back to 2004 and sending them to WikiLeaks. Even more embarrassing, the security company allegedly didn’t bother to encrypt passwords or e-mail addresses. The whistleblower site has been steadily releasing batches of the e-mails since February, but they didn’t get huge amounts of mainstream attention until correspondences about TrapWire were released on August 3rd. Soon after, WikiLeaks went down for ten days after an onslaught of denial-of-service attacks. Could it be part of some vast conspiracy? Probably not. An independent group called Anti Leaks, not any shadowy government agency, has taken responsibility for the attacks as part of their mission to take down WikiLeaks. And while TrapWire is also down, the site claims it’s due to maintenance. Conspiracy theorists are also worried about the fact that TrapWire is run by former CIA agents, since although the CIA isn’t allowed to spy on citizens for no reason, there’s not much stopping a private company from doing it. Especially after Occupy Wall Street, a number of people are suspicious that TrapWire is being used to track activists. But while Stratfor vice president Fred Burton did say in a leaked email that he wanted to “bankrupt” and “ruin the life of” WikiLeaks founder Julian Assange, there’s no evidence that he’s actively done so. Okay. Then what am I worrying about? What are you worrying about, you say? You’re worrying about ECHELON. It was as big in the news ten years ago as TrapWire is now. Some people are drawing comparisons between the two, but that’s not really fair. After all, ECHELON is about a zillion times bigger. Created during the Cold War, it’s a signals intelligence network shared between the United States, the United Kingdom, Canada, Australia, and New Zealand (otherwise known as the “Five Eyes” – creepy). Basically, that means it can monitor pretty much every phone call, e-mail, fax, or other electronic communication sent via satellite. It flags messages with particular top-secret words for further investigation. Even after a European Parliament investigation in 2001, not much is known about it beyond its basic function, and the fact that it’s only supposed to be for diplomatic espionage and probably doesn’t spy on private companies or citizens. Probably.